Property 6: Country Home next to Blow-Me-Down Covered Bridge in the Old Cornish Art Colony! Property 10: Right across from Silver Lake! Property 18: Absolutely The Best Location on Silver Lake.. Affordable country living in beautiful South Woodstock ! Property 22: Affordable country living in beautiful South Woodstock ! Peaceful & Private, Breathtaking Views/Mon-Weds. discount rate! Property 24: Peaceful & Private, Breathtaking Views/Mon-Weds. discount rate! Property 34: Beloved family home near Dartmouth College. 3 Bedroom Private Home with a Spectacular View with all amenities on one level! Property 39: 3 Bedroom Private Home with a Spectacular View with all amenities on one level! Dog-friendly house w/ charm & entertainment - 4 miles to nearest ski slopes! Property 42: Dog-friendly house w/ charm & entertainment - 4 miles to nearest ski slopes! 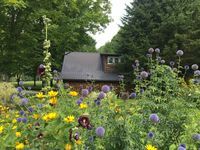 Property 43: Exquisite Log Home with views near Woodstock, Vt.
Property 46: Stunning Mountain View 3 Bedroom Home with 2 Person Hot Tub on Deck! Renovated! Cozy, contemporary with great location. Property 48: Renovated! Cozy, contemporary with great location. If you&rsquo;re looking for a gorgeous cabin in Vermont this is the perfect place! Ekiah, the owner, is the perfect host &mdash; providing prompt help, above and beyond hospitality and most importantly a beautifully designed home. The cabin was stocked with tons of firewood for the cozy fireplace, thoughtful local products and was surrounded by gorgeous Vermont nature&mdash; zero noise and pure starlit skies at night. This stay was absolutely flawless and I can&rsquo;t wait to return with my husband and son next winter! We loved this quiet, quaint spot! Spotless. Warm and cozy. Beautiful grounds. Kitchen had everything we needed ( pots, pans),etc. to make complete meal including spices- very impressed. We will be back. They have a cute little cabin you can rent, too!